According to a Marist poll, a whopping 44% of Americans make some sort of New Year’s resolution. 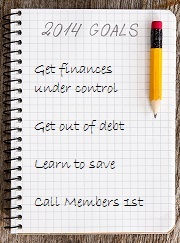 If you’re one of the 12% that are setting new financial goals for 2014, the tips below offer practical, sustainable changes that can substantially transform the weight of your wallet. Since these activities are effective even as short-term goals, they should help you maintain your resolutions long after January 1. Read on to get started. It’s easy to get swept up in spending spree fantasies when you receive your paycheck, but don’t forget to set apart a percentage of your income for your savings account. The key word is percentage. If you save in proportion to your income, your savings can adjust to any sudden changes in pay—for better or worse. This takes the pressure off of having to save a set amount each month. Try to make your savings contribution as seamless as possible. Some direct deposit options allow you to send a certain percentage of your income straight to your savings, before you have a chance to see it. If you don’t have that option, set aside money manually. To do this with discipline, it helps to think of your real income as your paycheck minus savings. If it helps, start at a modest 10%—which is the minimum generally recommended—and over time steadily increase the percentage of your paycheck you contribute to savings. The key is to let the savings build—set up a special savings account if you need to remind yourself not to dip into them. Look over your loans and credit card bills and sort them out in order of interest rate. Paying more than the minimum on the debt with high interest will save you incredible amounts in uncharged interest. Even if your other balances continue charging you interest, so long as you make the minimum payments and maintain the low interest rates, you’ll be ridding yourself of the fastest-growing debt. In addition, when you finally free yourself from the worst of your debts, you’ll not only have fewer payments to make, but you’ll feel fantastic knowing you avoided extra debt. Confidence from your previous success will make paying off small-interest debts that much easier and bring you one step closer to financial freedom. Another way of securing lower interest rates (and paying less in the long run) is by consolidating your credit card and loan bills. Consolidating means combining your outstanding debts, or transferring outstanding balances, onto a new loan or credit card with a lower interest rate. The main benefit of debt consolidation is that you can exchange the high interest rates of your previous loans or lines of credit for the lower rate of the new one. However, keep a sharp eye out for any deals that seem too good to be true. Sometimes, lenders will initially give you fantastically low rates, and then jack up the interest as soon as the promotional period expires. Be careful to read the fine print, or consult a professional, before committing to a loan consolidation. Learn more about the balance transfer options at Members 1st Federal Credit Union. Automating your loan and credit card payments can help you avoid those pesky late-payment fees or hiked up interest rates. 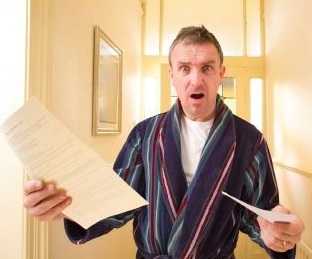 Late payments reflect badly on your credit score, so anything you can do to avoid missing the due date helps. Automated payment services like online bill pay or direct debit are easy to set up and require little to no maintenance. Keep in mind that we have the biggest tendency to overspend when we forget our debts and think of only the positive number in our accounts. Timely, regular and synchronized credit card payments will keep your brain (and your eager, spending heart) in check. If you use credit, it’s always helpful to have a credit report on hand. A credit report tells lenders all the details about your past credit use, payment history and total credit available under your name. It’s best to know exactly how your credit is doing in what areas, so you can make specific changes in your faulty credit habits. Luckily, through the Fair Credit Reporting Act (FCRA), you are entitled to one free credit report each year from each of the credit bureaus: TransUnion, Equifax, and Experian. To get a better sense of how your credit is doing throughout the year, order one of your free credit reports every 4 months. The best thing about these resolutions is that they are each practical enough to start immediately—even today—yet, they also promise to significantly improve your finances in the long run. Half the battle of keeping resolutions is your ability to feel good about what you’ve accomplished in the short-term, and these changes allow you to hit rewarding milestones along the way to accomplishing your bigger, long-term goals. With a little prioritization, effort, and discipline you can proudly make 2014 your best financial year yet!